Oxygen Software announces an upcoming training session on mobile forensics. The 3-day “Advanced Smartphone Forensics + Oxygen Certification” training session will be held in Norwalk, Connecticut on March 18-20, 2013. The three-day training session will tell students about the different approaches used in mobile forensics, their advantages and disadvantages, and teach about the best practices when using Oxygen Forensic Suite allowing to extract the maximum amount of information from the widest range of mobile devices. During the training session, students will learn about information hidden in different areas of mobile devices, and will be trained to extract existing and carve destroyed information from iOS, Android and other devices. The students will not only learn how to use all the advanced features of Oxygen Forensic Suite, but will be taught many useful forensic techniques such as identifying geographical coordinates accompanying many phone events, revealing suspects’ connections and analyzing suspects’ communication circles. 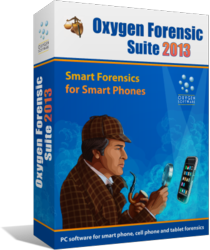 As an added benefit, students successfully completing the training will be certified to use Oxygen forensic software, and receive new or updated license keys for their chosen edition of Oxygen Forensic Suite. This certification information will be displayed on the product’s main window, and will be included on printed reports generated by Oxygen Forensic Suite. All students will receive individual printed and signed certificates. Successfully completing this training session makes students eligible to receive a life-time license for the Standard edition for absolutely free. Those who prefer a different edition of Oxygen Forensic Suite will receive a 20% discount towards the purchase of the Oxygen Forensic Suite Analyst and/or Network licenses. The training session will be held on March 18-20, 2013 in Norwalk, Connecticut. This event is suitable for novices as well as professional mobile phone examiners and forensic analysts. The three-day session will cover the topics on general smartphone forensics, advanced iOS and Android analysis. During the training, attendees will learn about data types and locations of data storages on various mobile platforms, geolocation information accompanying most events, destroyed evidence and deleted data recovery. The students will learn how to use all the advanced features of Oxygen Forensic Suite such as the Timeline (a feature offering convenient, single-place access to all activities and movements performed by the user, accompanied with geographical coordinates and arranged by date and time), Communication Statistics and social connections. Attendees will be taught how to bypass cell phone protection, how to forensically root Android devices, and how to deal with devices that cannot be rooted. The students will also learn extracting, filtering and analyzing various types of information available in smartphones and regular cell phones. Joining this training session is not just a chance to learn about the latest techniques in mobile forensics. By successfully passing the training, attendees become eligible to receive Oxygen Forensic Suite 2013 (Standard) free of charge for a life-time period.